Directions: The Missouri Civil War Museum [ Waypoint = N38 30.364 W90 17.028 ] is located in the Jefferson Barracks Post Exchange and Gymnasium Building at 222 Worth Road in St. Louis, Missouri 63125. From the visitor center head back to Grant Road and turn left (south). Take the first right onto Cy Road. After about 0.1 miles, turn left onto Gregg Road. After about 1 mile Gregg Road ends. Continue straight onto Worth Road. The museum is just ahead on the right. Description: It’s amazing what Executive Director Mark L. Trout and what I am sure is a plethora of volunteers have accomplished. The restored Jefferson Barracks Post Exchange and Gymnasium Building looks beautiful, and the museum is just another great reason to visit St. Louis. Be sure to watch the short video about the restoration of the building. The images of what they started with are in stark contrast to the beautiful facility that today houses the museum. 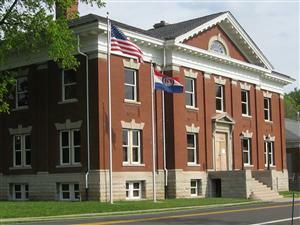 The main floor of the museum has panels which give an overview of the events leading up to and during the American Civil War in Missouri. There are lots and lots of artifacts to help you visualize the story told by the panels. On the lower level of the museum are a few more displays and a small video theater. 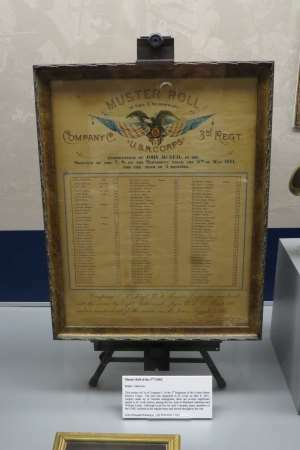 Two of the displays tells about the two main veterans’ organizations that served to memorialize the men who served during the war, The Grand Army of the Republic and United Confederate Veterans. Then there is a display about the Congressional Medal of Honor, our nation’s highest military honor that was established during the war. 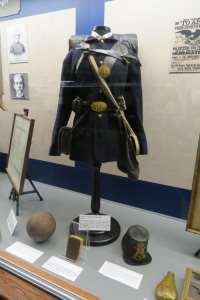 One of my favorite artifacts at the museum is the example of the outfit of a typical Federal infantryman. Of particular interest is the leather cartridge case worn on the belt. If you remember, it was the lack of this accoutrement that checked the Confederate advance into Springfield, Missouri on August 9, 1861. The Southerners were carrying their cartridges in their pockets, and when it began to rain, Brigadier General Ben McCulloch ordered his army to halt their advance. The wet weather could have rendered their scarce ammunition useless. And so the next day, the Southerners were surprised by the Federals under Brigadier General Nathaniel Lyon. I have long been fascinated by the artillery used during the American Civil War. 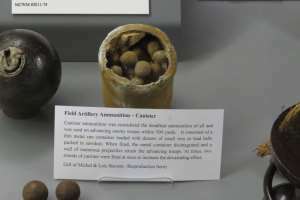 One of the displays focuses on the “Rolling Thunder.” My favorite artifact in this display was the canister round. I can only imagine the fear these men must have felt when they were charging an artillery battery, knowing canister was being fired at them. Something else to look forward to is the museum’s plans to restore the building next door and turn it into a Missouri Civil War Research Library. The museum’s Director of Library Services John L. Maurath is confident it will be valuable addition to the research facilities in the state. I only wish I lived nearby so that I could pitch in and help.